I can't believe it's that time again...monthly favourites. I have been trying a few new products out in the last couple of months which have become staples in my daily routine. 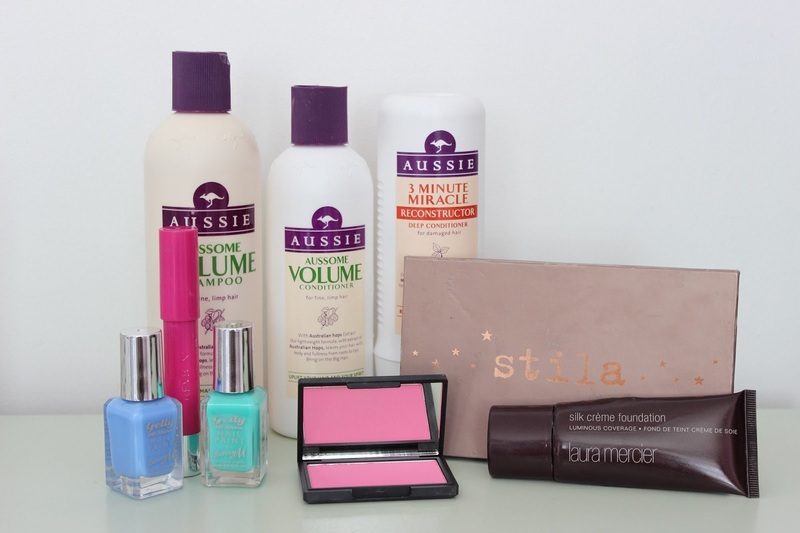 The Aussie Volume collection do seem to add a bit of volume, whilst making my hair feel soft and healthy. However, I did need to sort my hair out a bit as the ends were getting really damaged so I decided to get the Aussie Three Minute Miracle. I really love this product and I really think it has helped improve my hair. I have since had a haircut and bought another treatment by Dove, both resulting in my hair feeling a LOT better. I might do a post about my newly trimmed hair but stay tuned about the Dove miracle worker. I've also been loving the Gel nail polishes by Barry M; I love the unusual shades and the lasting power on these is amazing. Again Stila in The Light Palette and Revlon Just Bitten Kissable Balm Stain had to be in my monthly favourites as I am still loving them. 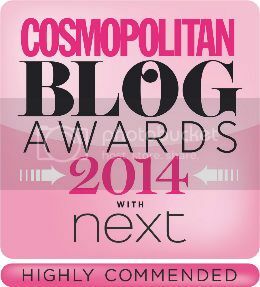 The Sleek blusher in Pixie Pink has become my everyday choice at the moment. I love the bright pink shade and it's great for this Spring weather. I bought the Laura Mercier foundation back in December and I wasn't sure at first. After using it everyday these last couple of months, I have to say I don't think I could live without it (well I could). It's nearly running out now after the five months of usage so I might have to bite the bullet and buy another bottle. I've actually added a couple of books to this month's collection as I've started getting back into reading as I've finished with my uni lectures and seminars. I've really enjoyed these Lauren Oliver books (which are part of a trilogy) and I can't wait to read the final instalment. Have any of you read those books or love anything I've chosen. I'll link my video, where I talk about everything in a little more detail. Thanks to anybody that read my last post about the pretty organising I did to my room, I had such an amazing response. I've been wanting to try the Laura Mercier silk cream foundation for a while now but can't seem to find it here. Loved this video! Really loving that you started you tube! I really want to read those books! They are on my list, but not got round to reading them yet! Let me know if you enjoy them. Hey Faye, Great post. I really need to get my hands on some of those Barry M Gelly nail polishes! Love if you could check out my blog! The sleek blush looks amazing!! 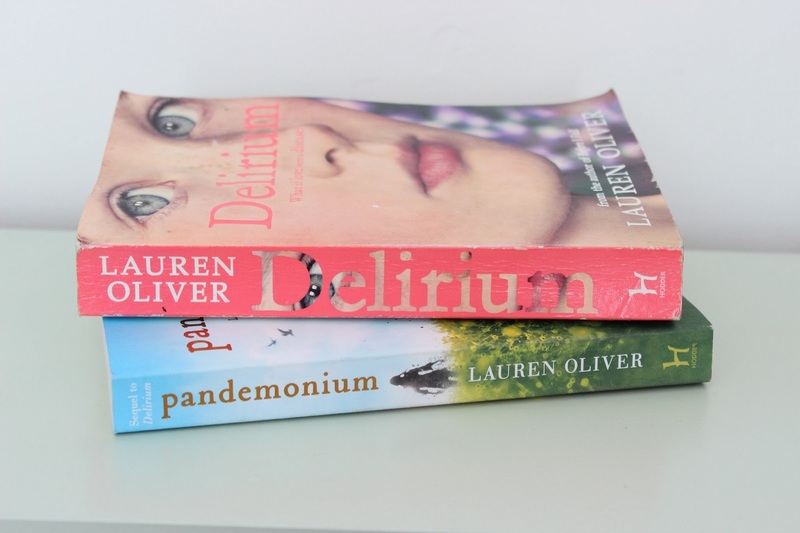 I am absolutely in love with the Delirium serie!! It's one of the best series I have read in a long time! Did you know that in september or october there was a tv serie coming out about these books? So excited! !